Our Abpromise guarantee covers the use of ab34419 in the following tested applications. WB 1/250 - 1/500. Predicted molecular weight: 83 kDa. 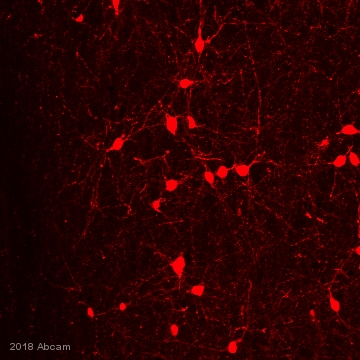 This image shows a section of a formalin-fixed paraffin-embedded adult mouse brain showing ChAT (red staining) in cholinergic neurons of the caudate-putamen nucleus. Antibody ab34419 at a dilution of 1/100. Publishing research using ab34419? Please let us know so that we can cite the reference in this datasheet. Thank you for contacting Abcam. I am sorry to hear that you are still not able to get any convincing staining using ab34419. I would be happy to get you a replacement, the ab70219, I am having a little difficulty finding your original order though, so if you could send me either the PO# or order number that was used, that would be great. I look forward to your reply and getting you a replacement antibody. Thank you very much for your interest in our products. The following antibodies are tested and guaranteed for IHC-P in rat. Unfortunately, we do not have blocking peptide for these antibodies in our catalogue. ab68779 Click here (or use the following: https://www.abcam.com/index.html?datasheet=68779). ab6168 Click here (or use the following: https://www.abcam.com/index.html?datasheet=6168). ab70219 Click here (or use the following: https://www.abcam.com/index.html?datasheet =70219). ab18736 Click here (or use the following: https://www.abcam.com/index.html?datasheet=18736). ab34419 Click here (or use the following: https://www.abcam.com/index.html?datasheet=34419). The following antibodies have a blocking peptide readily available, but are not tested and guaranteed for IHC-P. Therefore you might be eligible for our testing discount program if you would like to test one of these antibodies in IHC-P on rat samples. ab85609 with ab97420 Click here (or use the following: https://www.abcam.com/index.html?datasheet=85609). ab50412 with ab50440 Click here (or use the following: https://www.abcam.com/index.html?datasheet=50412). ab27484 with ab45678 Click here (or use the following: https://www.abcam.com/index.html?datasheet=27484). Please do not hesitate to contact me again with any further questions or if you consider testing one of the latter antibodies in IHC-P.